ایسے کئی اکاؤنٹس ہیں جو اسائلم سروس کے سکائپ کی طرح دکھتے ہیں. اسکائپ کی شناخت کاپی کریں اور اسے Skype کے تلاش کے بار میں پیسٹ کریں. براہ کرم اس بات سے آگاہ رہیں کہ اسکائپ اکاؤنٹ جو پروفائل تصویر کے طور پر یورپی یونین کا پرچم ہے درست نہیں ہے! کبھی اس پر کال نہ کریں اگر آپ اسائلم اپلائی کرنا چاہتے ہیں!!! PLEASE ONLY CALL THIS ACCOUNT! Click on the picture to enlarge it. There are multiple accounts that look like they are the Skype line from the Asylum Service. 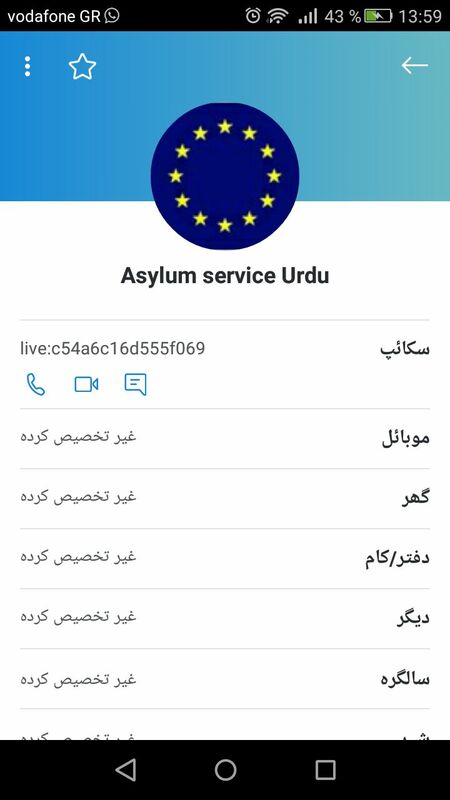 To make sure that you call the correct one please type asylum service urdu panjabi in the search bar of Skype. The correct Skype ID is live:68dfbd8c11b07edc. Please always double check if the Skype account you are calling has this Skype ID. To see the Skype ID of an account, first select the account. Then click on the name of the account which is on top (in this case the name it is "Asylum Service Urdu Panjabi"). In the following window you can see the Skype ID. Copy the Skype ID and paste it into the search bar of Skype. For more information about Skype, please click here. ← Please be aware that the Skype account which has the European Union flag as a profile picture is NOT the correct one! Never call this account if you want to apply for asylum!!! Some accounts look like they are from the Asylum Service, but they are not.